Of course, both Genband and Sonus had lineages similar to BroadSoft’s, and have had some overlapping capabilities for some time. They all sell to carriers, so there’s a common customer base, but only with last year’s merger that created Ribbon Communications has it made sense to think along these lines. Prior to this, there really wasn’t much talk about UCaaS and CPaaS, but under the large tent of all-things Kandy, it’s very much Ribbon’s focus now. Now consider how much has changed in a year’s time. BroadSoft has, by far, been the most successful communications platform play – or arms dealer if you like – for service providers of all stripes. BroadSoft’s rich exit to Cisco was well-earned, and while their integration is still being worked out, you could argue that leaves a void in the market. Independents are becoming less common as the consolidation trend continues, and it’s fair to say that carriers still want choice for partners other than Cisco. Ribbon also came into being during this passage of time, but as a merger among relative equals, there was more leeway to create a distinct identity that could have a good play in this space. You may not have thought about Ribbon like that before, but most of the pieces have been there all along, and with the just-passed Perspectives18 being the first one under the new order, that’s the main takeaway for me. Unlike BroadSoft, the legacy of Genband and Sonus has been hardware and the not-so-glamorous world of gateways and SBCs. 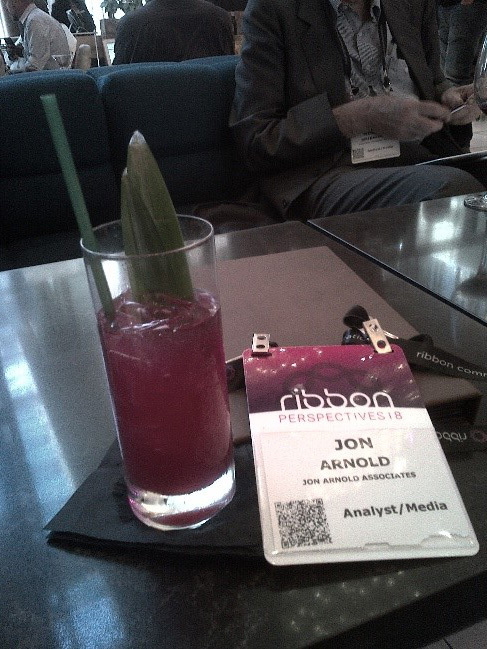 Software, the cloud and applications have come along more recently, and that’s really what Ribbon is all about. Perspectives18 was the first window we’ve had to see this new vision, and while the messaging was largely a continuation of earlier conferences, the scope is broader now that the merger has been digested. So, is Ribbon Communications the next-best thing to BroadSoft? They certainly think so, but the path to success is far from certain. While cloud seems to be the plan across the board in the collaboration space, it has not proven to be profitable, at least for the established players. In that regard, Mitel’s news about going private is quite timely. Clearly, they know that the fruits of consolidation and becoming cloud-first will take some time to bear, and the runtime to get there will certainly be easier to support being private. Ribbon’s financial structure is complex, but they won’t have that luxury as a public company, and I take Mitel’s news as a potential bellwether for what lies ahead. On one hand, you have to be concerned about competing against the established players, for whom profitability is paramount. However, the broader landscape includes the disruptors like Amazon and Twilio – and for them, market share is the focus, not profits. While the pool of players is getting smaller, the competition is getting harder, not easier, and success is now being defined in months, not years. To help make more sense as to where Ribbon will land by Perspectives19, here’s a summary of the bright spots and points of caution that resonated for me from the conference. We were told there were over 600 attendees from 40+ countries, so the scope was global. Ribbon also showcased several Tier 1 customers/partners during the program, such as Verizon, Polycom, Intel and Red Hat. Am sure this served to inspire confidence and prove that they’re carrier-grade. Given how messy the competitive landscape has become, these are important messages to convey. Ribbon is not going to make it signing up loads of Tier 3 carriers – they need the volume and reach of big carriers, and that’s a more demanding customer set. Given the histories of Genband and Sonus, they have the bona-fides to be carrier-grade, and aside from being a strong calling card, this helps differentiate Ribbon from the pack, especially those that are truly cloud-based. Ribbon’s view is that “the best video and voice quality wins,” and that’s a defensible position given the short history of cloud players and the spotty history of OTTs. To anchor that claim, they talked about partnering with Vidyo for best-of-breed video, and using the Opus codec to provide top-notch HD voice. Of course, Kandy is a lot more than voice and video, but setting the bar high for quality is a good strategy they can deliver on. They stated on a few occasions about having over 700 patents related to Kandy. That’s a pretty strong IP portfolio, and I’m sure it goes a long way to making Kandy carrier-grade. To be fair, I don’t know how that number stacks up to UCaaS and/or CPaaS competitors, but it’s too big to ignore. Perhaps more importantly – and I really should have asked about it – is how many of those patents are pre-Ribbon. I suspect many came with the Nortel acquisition and maybe other pickups along the way. Fair enough, but considering how this merger was based on synergies, it would be telling to know how many patents have come since the merger. That would be a sign that 1+1=3, and also sends a message to the market that Ribbon was created for the right reasons. The messaging was all about cloud, and CTO Kevin Riley made a strong case for this being the “end game,” so there’s little doubt which basket their eggs are in. They also talked about how most carriers are at some stage of IP transformation, so this will take some time. One reason is the simple reality that large-scale changes don’t happen overnight, but something more telling came from the service provider panel session. Bell’s CTO Geoff Moore took us back to PSTN 101, explaining that his 41-year-old legacy Nortel switch still works fine, delivering 5 nines service. That presents a real existential problem and is typical of why carriers are loathe to kill the golden goose. They were always last to the table with VoIP for very good reasons, and as Geoff noted, this makes it hard to get funding for network transformation projects. Taking things a step further, he conceded that you “kinda need a disaster or failure” to get this going. Probably not the messaging the Ribbon folks wanted to hear – will be interesting to see if they bring Geoff back next year. To be fair, Geoff wasn’t alone, as George Karatzis from Verizon added that it will be hard to keep funding these projects if new services don’t generate new revenues. David Walsh revisited his messaging from last year about why companies like Amazon, Airbnb, Uber, Netflix, et al are so disruptive – and so successful. He did a great job talking about how these are data companies, and that’s the competency service providers must now pivot on. There’s definitely truth to that, but he also positioned them as mortal threats, asking if “the big five are going to crush everyone?” His answer of course, was Kandy, as it provides the essential capabilities to compete against this crowd. I don’t think anyone in the audience wants to go mano-a-mano with Amazon, but the bigger the threat, the greater the call to action. Along those lines, he also talked about Twilio being the “Uber of telecoms,” which is a more apt target for this crowd. Anyhow, point taken – Kandy is the kind of platform that carriers need to stay in the game, but I don’t think they need to worry too much about the big five. Just focus on innovation and time to market, and the rest will take care of itself. That was another good takeaway from David, as he emphasized that disruption comes from investing in innovation rather than infrastructure, and while that plays perfectly into the Kandy value proposition, it remains to be seen if carriers can innovate fast enough to create a new golden goose. Show me the money. While all the talk at Perspectives was about Kandy and the strong growth opportunity they see for converging CPaaS and UCaaS, when it comes to revenues, “we’re staying silent.” While they’re carefully tracking metrics, David Walsh made it clear that it was too early for that, and it’s more important right now to find the right partners who can monetize Kandy. That’s fine, but this is where the aforementioned short leash for public companies comes into play. Am pretty certain those revenues are pretty minor, and for an entity tracking for $400+ million in annual revenues, it’s fair to be asking some questions. I’m a fan of Kandy, but was surprised to hear zero discussion about Ribbon’s overall financial performance and where exactly those revenues are coming from. Along those lines, considering this was the first big event for Ribbon, one might have expected some discussion about how the merger is going, and how the core business that got them here is performing. If you’re curious, have a look at their SEC filings, where the most recent one for Q1 2018 shows a GAAP net loss of $44.9 million. The non-GAAP loss was only $4.0 million, but whichever number you go with, Ribbon is not yet profitable. The analyst in me will revisit this later in the year, by which time the much-discussed savings from synergies will hopefully have materialized. If not, that leash might get a bit shorter. To wrap up, you couldn’t help notice the contrast in the changing of the guard. Being a Genband event, David Walsh was always the face of Perspectives. With Ribbon, the President and CEO is now Fritz Hobbs, so neither CEO from the predecessor companies continues in that role. David Walsh now holds the title of Founder, Kandy, which sounds pretty vague to me. I have no insights about the power structure or leadership dynamics, but in my view, Fritz Hobbs is a money guy, and David Walsh is a vision guy. These are very different styles and competencies, but as with the recent Polycom-Plantronics marriage, it will be interesting to see which leader carries the day. However, I will say that with this being the first Perspectives as Ribbon Communications, there was a missed opportunity for Fritz Hobbs to connect with the audience and set out a vision for both their future and Ribbon’s. I really would have liked to see that, but he barely spoke for five minutes, and it left me wondering about where things are going. I love David’s energy, style and audience engagement, but really, can you imagine two leaders who could be more different? I could have covered more ground from Perspectives, but this should provide enough food for thought. They may well be the next-man-up after BroadSoft, but as currently constituted, I don’t see as rewarding an exit unless Kandy really delivers. It certainly is possible, but this sure is a tough market now. Being carrier-grade seems to be their strongest story, as a foundation of quality will be essential for monetizing those APIs. We’ll know soon enough if carriers have drunk the Kandy Kool Aid, but this is another indication of how the collaboration space is evolving. I prefer drinks that are less sweet, and this one below was pretty good. I had no idea the LA Sunset cocktail I ordered would perfectly match my badge, so you gotta give me props for nailing this. After all, it’s LA, where looks matter more than anything else, and you’d have to agree that this drink sure looks mah-vel-ous.